While the Curriculum and Instruction team at Learners Edge reviews hundreds of texts every year around which to write courses, not all topics can be covered in our catalog. My role as the advisor for this course has given me a bird’s eye view into what the Book Study can do for educational professionals. A group of school nurses tackled the vaccine controversy by reading a text on the necessity of vaccinations and disseminating their learning to the community. A principal helped his faculty and staff understand math running records through a Book Study. An instructional coach helped his district develop a mentorship program by leading a Book Study around a teacher mentorship text. One group from the Dawe School in Stoughton, MA has been taking the Book Study to a new level: not only connecting with one another to study an interesting text, they also deepened their learning by connecting with the authors! The Stoughton group selected It’s All About the Books as their text in 2017 and tagged authors Tammy Mulligan and Claire Landrigan in a Twitter photo of the group meeting. 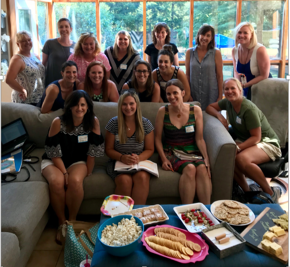 As it happened, the authors were going to be working with the Stoughton district for professional development — so they attended a meeting with their group. "I had a wonderful conversation about my book Cultivating Curiosity with the teachers of the Dawe School. Their insights and questions revealed to me that they're being given the freedom and encouragement to be true teacher/scholars, and their students will benefit most of all from this stance toward education. The experience was extra meaningful to me since I went to the Dawe School from kindergarten through sixth grade, and many of the stories and examples of my own transformative learning took place within those very walls! What an honor to come back after all these years and see that the passion for meaningful pedagogy continues." "Teachers found the course work reflective, valuable, and to be worth their personal time. Learners Edge Book Study left our staff eager to learn and they are now asking each semester if there will be another one coming up! 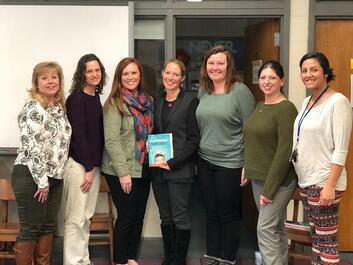 To conclude some of our book studies, reaching out and actually connecting with the authors, such as Wendy Ostroff, Tammy Mulligan, and Clare Landrigan, has brought their texts and instructional recommendations to life in a more impactful and applicable way for the teachers participating in the book study. Facilitating this course for my colleagues was easy and beneficial. The Book Study has brought teachers together from not only my school, but from across our district to have meaningful discussions about current professional literature. It has been rewarding to observe the teachers apply the knowledge and skills from the text immediately into their classrooms. Being able to take a course where we chose the text has created a newfound interest and ownership over our adult learning lives. " Plus, did we mention that the Book Study has a group discount? The more the merrier (and cheaper)! How does your group of educators want to change the world? Click here to learn more, and to submit your text for approval.